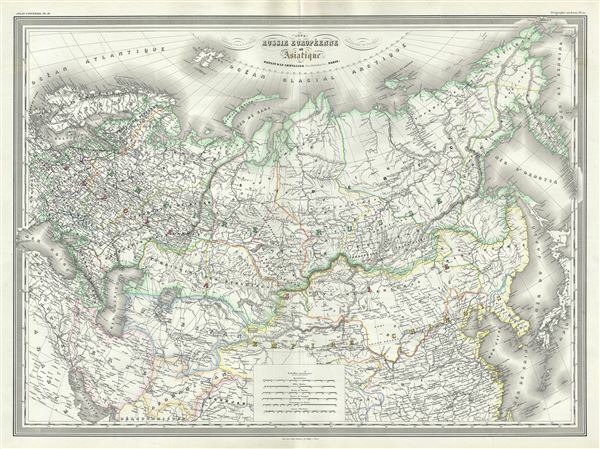 This is an uncommon 1860 elephant folio map of the Russian Empire by A. H. Dufour. It covers the Empire in its entirety, both in Europe and Asia, as well as parts of neighboring Tartary, Persia, Afghanistan, Chinese Empire, Japan and Korea. In 1815 Tsarist Russia emerged from the Napoleonic Wars economically insolvent and politically fearful of the Revolutionary fervor that had just swept through Europe. In order to shore up Russia's economic position, the Tsars began an aggressive series of expansions into the Caucuses and Central Asia that would vastly increase the landmass of the Russian Empire. When this map was made, Russia was under the suzerainty of Tzar Alexander II. Alexander is best known for his liberal reforms including the emancipation Reform of 1861 which liberated Russia's countless serfs and is considered to be one of the most important events in 19th century Russian history. This map was prepared by Auguste-Henri Dufour and engraved by Charles Dyonette for publication plate no. 31 in Armand Le Chevalier's 1860 edition of Atlas Universel, Physique, Historique et Politique de Geographie Ancienne et Moderne.